In almost every show is a lull – a quieter often melancholic segment which will emerge three quarters of a way through an otherwise a magnificent production. But there isn’t a smidgen of a dull moment in Showbiz Christchurch’s electrifying production of the world-wide phenomenon Wicked. 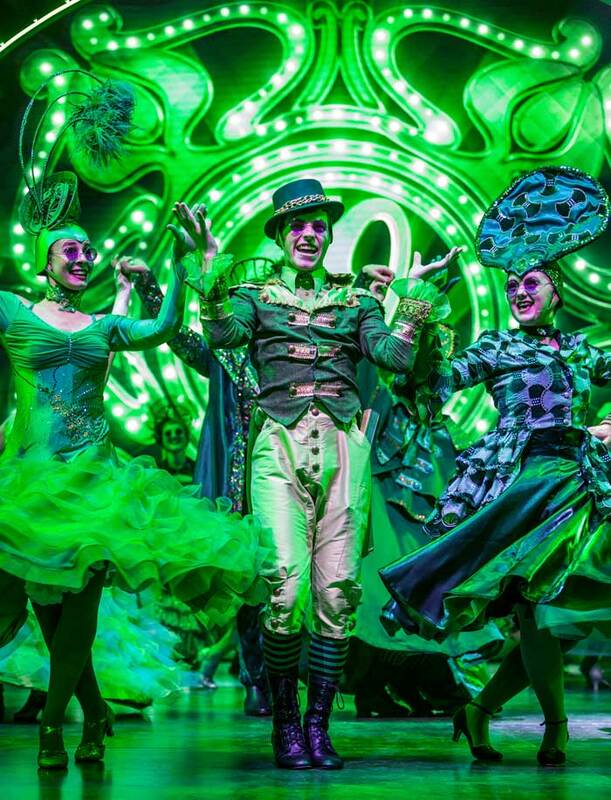 Even the most hard-nosed pragmatist may believe in magic after watching the Isaac Theatre Royal be transformed into the spell-binding, eccentric, emerald-coloured wonderland of Oz. Wicked is one of my favourite musicals of all time – and it was a dream come true for the show to finally premier in Christchurch. The powerhouse ensemble is a force to be reckoned with. I often found myself leaning back in my chair gawking at the fairytale extravaganza in front of me,­ particularly when the entire cast sang together in the big showy numbers. The show explodes with the opening performance of No One Mourns the Wicked with the full ensemble cheering the death of Elphaba “The Wicked Witch of the West”. It is one of many moments that showcases the high calibre of talent in the city. Following the opening performance, the show then travels back in time centring around the unlikely friendship between two sorcery students – Elphaba and Glinda the Good Witch. It is easy to see how the empowering tale, witch is the backstory to The Wonderful Wizard of Oz has captured hearts around the world. Rebekah Head as Glinda and Heather Lee Wilcock as Elphaba lead the show to glory with their exceptional performances. Head’s angelic, crystal clear voice and graceful, dainty persona perfectly matched the classical fairy of every child’s imagination. Lee Wilcock drives a fiery performance as the dark, wild Elphaba and captures a head-strong woman who is not afraid to go against the grain of the corrupt government in Oz. Her performance of Defying Gravity sends chills down the spine, particularly when she hit the long, mighty note at the end of the song. Together they were unstoppable – their fast-pace, crisp performance of What is This Feeling? was impeccable. The other amazing part of the show was the audience’s reaction. It is no secret Christchurch audiences have earned a bit of a reputation for being a slightly on the conservative side. But between the whistling, large applauds and standing ovation at the end ­ the performers got the positive response they deserved. Apart from the odd timing issue with the music and perhaps some opening night nerves this show was perfection. Never have I ever been so sad to see the final curtain fall and wanted to race back to watch the show all over again. Do you believe in magic? Looking for proof that a wave of a wand or a twitch of the nose will make dreams come true? Then get to the Isaac Theatre Royal to witness two otherworldly beings in a spellbinding performance that can only be called magical. Showbiz Christchurch secured the rights to the New Zealand premier of the smash hit Broadway musical Wicked, a theatrical coup not only because it is one of the most popular shows in the world right now, but also because it offers an opportunity to showcase the formidable number of female triple threats talents in our city. The lead roles of Elphaba and Glinda require performers with outstanding vocal ability, excellent acting ability, and solid dancing skills. Showbiz Christchurch was able to cast those parts perfectly not once, but twice. On the night I went, Elphaba was played by Jane Leonard and Glinda by Ellie Neal. Heather Lee Wilcox and Rebekah Head play these roles on alternate nights. I have been assured Wilcox and Head are every bit as wonderful as the duo I saw onstage, but I am adamant that I saw the perfect pair of witches performing. Wicked is ostensibly a prequel to Wizard of Oz but the musical transcends the source material. Delving into the background of the Wicked Witch Elphaba and Glenda the Good allows exploration of themes such as the nature of good and evil, discrimination, and revolution versus terrorism. Creating backstories fleshes these one-dimensional caricatures into complex, nuanced roles. As always, Showbiz has assembled an impressive ensemble. The company numbers are brilliant stage spectacles, with the warm harmonies created by the ensemble swelling to fill the auditorium, and Glen Harris’ clever choreography executed with precision and energy. Annoyingly I find myself repeating a gripe I have aired in past reviews of Showbiz musicals; poor diction. The muddy articulation and failure to enunciate consonants clearly made the lyrics indecipherable. It’s a shame to have such a basic foundation of performance letting down the fantastic group numbers. The magic really starts during Elphaba and Glinda’s duet, Popular. As Glinda teaches Elphaba to bend and snap – sorry, to “toss, toss” her hair, we see a believable bond form between the two. Henceforth whenever I blow out my birthday candles, throw coins in a well or rub magic lamps, I will be wishing for an invite to a magical musical slumber party with Jane Leonard and Ellie Neal. Matching the sheer star power of Leonard and Neal is no mean feat, yet the rest of the cast is equally engaging. If I hadn’t already lost my heart to Elphaba and Glinda, I could have fallen for the charming rogue Prince Fiyero (Fergus Inder). Tom Worthington (Boq) is marvellous as a Munchkin who cant move on, and Jack Fraser (Dr Dillamond) elicits sympathy from the crowd without the benefit of facial expression. Kira Josephson’s character arc as wheelchair bound Nessarose makes excellent use of her acting ability, although opportunities were missed regarding her part in dance numbers. Nessarose was pushed to the side instead of being integrated into the choreography. For those interested in ideas of how to choreograph a dancer in a wheelchair, I can recommend the work being done by Jolt mixed ability dance company. Sidelining the differently-abled character undermined the anti-discrimination message somewhat. Showbiz stalwart Sarah Greenwood Buchanan is unrecognisable as Madame Morrible, a hybrid of Harry Potter’s Professor McGonagall and The Hunger Games’ Effie Trinket. Buchanan is a powerhouse, giving Showbiz another solid performance. The set deserves a round of applause of its own. While I’ve always enjoyed the way Showbiz uses the height of the Theatre Royal stage (incorporating balconies, staircases and flying characters), this was the best use of the depth of the space I have seen. In addition to the stunning set pieces, set designer Harold Moot has collaborated with lighting designer Grant Robertson and AV designer Dave Spark to incorporate lights and stunning screen imagery. The captivating scene transitions drew audible sounds of admiration from the audience. Head mechanist David Bosworth adds extra stage sorcery with mysteriously moving machinery. The Wizard of Oz’s Deux ex Machina is framed by a system of Steampunk-esque slow-moving cogs, in a breathtaking stage picture. This is another theatrical triumph for Showbiz. Don’t miss this brilliant Broadway hit with local talent. I first fell in love with Wicked when I saw it in Sydney and since then I've listened to the Broadway original cast recording countless times, hoping that eventually it would come to Christchurch. Showbiz Christchurch's production is everything I could have hoped for, from excellent leads and a strong cast going right through to the back of the energetic chorus line, a sumptuous set, dazzling costumes and a tightly-knit orchestra. Skilful lighting brought the whole thing to life and sound was well done save for the occasional mic crackle. Director Stephen Robertson should be well pleased with the results of his labours. It all hinges on having two main female leads that can flesh out the characters so that the comedy is as fun as the pathos is moving. Rebekah Head (Glinda) and Heather Lee Wilcock (Elphaba) were truly outstanding. Kristin Chenoweth and Idina Menzel, from the Broadway recording, are hard acts to follow, but Head and Wilcock nailed it. Head captured the shallowness of Glinda, but also her softening later on and she sailed through those high notes. I loved the shades of doubt she brought to Thank Goodness. Wilcock's I'm not that girl was tender, yet she had real menace as she rose in Defying Gravity, her slide into wickedness complete in a venomous No Good Deed. Together, they handled the showstopper Popular superbly, really making the most of it. I did, however, feel that the tempo was a little quick, both here and in a couple of other places, so that some of the lines appeared rushed. In support, Fergus Inder made for a suitably nonchalant Fiyero and Chris Goodyear a convincing Wizard. I enjoyed Sarah Greenwood Buchanan as Madame Morrible, creating interest in a character I had hitherto overlooked. Tom Worthington (Boq) and Kira Josephson (Nessarose) created a nice chemistry and Jack Fraser was a fine Dr Dillamond. Heather Lee Wilcock showed both tenderness and real menace as Wicked's Elphaba. Hurry to book your ticket now – as the song from the show goes, they're going to be popular! As someone who has never cared much for the Wizard of Oz, the prospect of a stage show based entirely on the untold story of the witches of the same imaginary land left me feeling a little apprehensive. The process of munchkins, men made from both tin and straw and an afraid lion all mixed in together with a girl in red slippers never really piqued my attention growing up and so I headed to the Isaac Theatre Royal on Saturday night for the second showing of Showbiz Christchurch’s latest production, Wicked with some strongly mixed emotions. Knowing there was some incredibly talented Mid Canterbury faces in the cast had eased my apprehension somewhat and within two minutes of the curtain rising I found myself captivated, intrigued and sitting on the edge of my seat enjoying every moment. The world-renowned show, that has been a hit across the globe for a decade now tells the untold story of an unlikely but profound friendship between two girls who first meet as sorcery students at Shiz University: the blonde and very popular Glinda and a misunderstood green girl named Elphaba. Following an encounter with The Wonderful Wizard of Oz, their friendship reaches a crossroads and their lives take very different paths. Glinda’s unflinching desire for popularity sees her seduced by power while Elphaba’s determination to remain true to herself, and to those around her, has unexpected and shocking consequences for her future. Their extraordinary adventures in Oz sees them fulfil their destinies as Glinda The Good and the Wicked Witch of the West. Nothing is left unturned here by a star-studded line up of directors and their staff, from the programmes sold at the front door, to the shoes worn by those on stage, everything beams professionalism and brilliance and the entire production team from the set design, choreography, costumes and music were fully deserving of every plaudit thrown their way. As luck would have it, former Ashburton lass, and NASDA graduate Jane Leonard was on one of her alternate nights of filling the lead role of the green-skinned Elphaba, playing alongside Wellington’s Ellie Neal who fulfilled the role of Glinda. The pair were, quite simply a match made in heaven. They bounced off each other with the right amount of enthusiasm and humility that you’d expect from such a high-end show and were the deserving shining lights of the night. It is hard to imagine the show without these two playing their respective roles. I sympathise with Leonard’s character somewhat, because I too am green. Green-eyed with envy at the incredible talent this former Ashburton girl possesses. She commanded the stage, her presence unwavering and demanding and her vocal performance was nigh on perfect. The show’s most well-known song, Defying Gravity is somewhat of a double-edged sword in the fact that it is such a tune that it’s hard not to enjoy, but equally as difficult vocally and requires some skill to perform. Leonard’s effort, was quite simply put, perfection wrapped up in green and black. So much so there was the sense of a standing ovation as the curtain fell down on the first act with her powerful tones ringing through the ears of the packed house. The ovation didn’t come then, but it did as she made her curtain call with the large Ashburton contingent in the crowd making sure that others there new just how proud they were of her effort. Leonard wasn’t the only local on stage though. The experienced Greta Casey-Solly made an appearance as an interestingly attired mid-wife and her own usual manner exuded confidence and power while young rising star Jack Hanrahan was a prominent figure in the ensemble showing up numerous times with his usual amount of flair and skill. The only gripe I can muster, and it is a very minimal one, is that at times the abrupt loudness of the very brilliant band drowned out some soloists, and understand their lyrics became a little more difficult than it should have. This was more an issue in the opening act and only for certain performers (not Leonard) but seemed to have been ironed out by the time the curtain rose again for the second act. So, take it from this former Oz-Doubter, that Wicked is a show not to be missed. At around $60 a ticket, it’s well worth the trip up the road for a night of good, quality entertainment and one I’ve got no hesitation in recommending to anyone. Showbiz has crafted something wickedly wonderful for Christchurch theatre audiences. Wicked is the hotly anticipated show of the Saunders & Co Showbiz 2018 Season. It is a musical theatre juggernaut, wowing millions of people worldwide and becoming one of only a small number of shows to have generated over $US1billion worldwide. Christchurch – it is a truly wicked treat to be able to see this show in our city. The story is described as a prequel, or backstory, to the L. Frank Baum tale of the Wizard of Oz. We are reminded that there are always two sides to every story, and we shouldn’t be too quick to judge – even if someone is the so-called “Wicked Witch of the West”. There are an extraordinary number of subtexts and themes blended into the storyline. It’s a romantic comedy with strong political undertones, a commentary on animal rights with a talking goat and flying monkeys, a warning regarding the pitfalls of getting what you want, a celebration of friendship, and a homage to a classic film. It is a story that connects with the heart and challenges perceptions. Wicked is an ambitious production, and one that will draw inevitable comparisons to other productions many people will have seen over the last 15 years on Broadway and the West End. Showbiz Christchurch, the cast, and crew deserve the standing ovation they received on opening night. People who are expecting to see powerhouse vocals and music, sumptuous costumes, a dancing ensemble group, and incredible stage sets will not be disappointed. The lead roles of Elphaba and Glinda are shared throughout the season, and opening night performances were from Heather Lee Wilcock (Elphaba) and Rebekah Head (Glinda). Wilcock delivers a phenomenal performance as the green-skinned “Wicked Witch” – her opening song The Wizard and I attracted a rapturous applause from the audience, and the climax of Act 1 Defying Gravity nearly tore the roof down. Rebekah Head balanced the amiable, comic and earnest tones of the Glinda character with great effect, while also delivering a powerful soprano vocal performance. Bravo to both! The heartwarming duet For Good drew tears from audience members around me, and was a testament to the strength of their performing relationship. Other main roles are delivered with fabulous vocals and consistent characterisation. Sarah Greenwood Buchanan did double duty in this production – a fabulous performance onstage as Madame Morrible, as well as a complex off-stage role as wig and hair manager. Fergus Inder (Fiyero) and Tom Worthington (Boq) were fabulous as the roguish prince and young munchkin. Kira Josephson (Nessarose), Jack Fraser (Dr Dillamond, Father), and Chris Goodyear (The Wonderful Wizard of Oz) all gave terrific supporting performances, with solo moments helping to elevate the show’s high-quality. The ensemble were also incredible and provided impact with both grace and power. Dance pieces – clearly influenced by choreographer Glen Harris’ ballet experience and background – were elegant and sophisticated. Costumes and makeup were dynamic, and a visual feast particularly when the ensemble appeared on stage in tableau. Bravo therefore to Stephen Robertson (Director), Richard Marrett (Musical Director) and Harris for their clearly successful partnership in bringing all aspects of Wicked together coherently and with such extraordinarily high standards and professionalism. These gentlemen are an institution in the Christchurch theatre scene – our expectations of them have been met convincingly in this incredible production. The orchestra is, as we have come to expect, virtuoso, and the group of backing vocalists add depth and energy to the chorus numbers. Bravo also to the supporting production team – stage, set, sound, lighting etc all worked well together, without any aspect detracting or distracting from another. With Showbiz Christchurch’s talent and vision clearly being unlimited, this season of Wicked is sure to leave audience spirits ‘defying gravity’. After years of encountering, and failing to seize, opportunities to see productions of Wicked in New York and London, I finally get to see it in Showbiz Christchurch's lavish and spectacular production at the Isaac Theatre Royal. Almost everything about the production and the stage and pit performances is slickly impressive and breathtakingly dazzling. Director Stephen Robertson certainly knows how to get the absolute best from his large and talented cast, ensemble and production team. If there are occasional weaknesses in characterisation from individual performers, Robertson knows how to disguise them with visual spectacle and creative staging, helped by Glen Harris's effective choreography. The range of instrumental textures and effects is fully and masterfully realised by the pit orchestra, and Musical Director Richard Marrett draws lively and consistently idiomatic playing from his notably accomplished musicians. The costumes (especially the hats) are nothing short of astonishing. Equally astonishing is the fact that, although Diane Brodie is credited in the programme as Wardrobe Manager, no designer is mentioned! In a production that draws so much of its positive effect from visual elements, tonight's line-up of costumes almost makesthe show – truly amazing! No less effective is Harold Moot's set design which, assisted by Dave Spark's stunningly atmospheric videography and Grant Robertson's beautifully detailed lighting, is another of the production's greatest strengths. The exceptionally striking masks and wigs also need to be acknowledged, especially Dr Dillamond's goat mask. With all this talent in evidence, what a pity about the show itself! Although the concept is clever, at times almost thought-provoking on a rather superficial level, and littered with witty puns and wordplays, it tends to take itself too seriously for much of the time. Too often I feel I am being lectured about, for example, tolerance, perspectives or political corruption, and the running theme of flawed personality traits lacks enough believable consistency to make any worthwhile point, although I do find myself laughing willingly at the show's sprinkling of genuine humour and admiring the brilliance of the ensemble staging, especially in the earlier scenes of Act 1. But I find nothing to enjoy in Stephen Schwartz's actual musical conception. While the lyrics are often cleverly inventive and sharp-witted, the music itself is so cliché-ridden and lacking in genuine originality that any number of Broadway hack-writers could have penned it. Some of the more well-known songs such as ‘Popular' and ‘Defying Gravity' certainly benefit from their dramatic context, but while ‘Popular' relies on its lyrics and, in this performance, Ellie Neal's (Glinda) superb vocal and visual delivery – a real cameo highlight – ‘Defying Gravity' is a typical example of overhyped climaxes and inflated impact-by-sledgehammer. In this song, Jane Leonard (Elphaba) is certainly up to its vocal demands, as she is throughout the show. The two witches alternate from night-to-night, so this second performance is opening night for Jane Leonard and Ellie Neal. If the previous night's pair of witches is anything like as good as these two, then no-one need worry about which cast to choose to see. But tonight the house does seem to be peppered with Jane Leonard's friends, family and fellow NASDA graduates, because the response (scattered throughout the stalls) to almost her every note and move is greeted by cheers and whistles as OTT as the overwrought music. Schwartz's songs rely heavily on the craft and imagination of his orchestrators and arrangers, but even they seem to find little alternative to giving the music its impact except through relentless and wearing volume. Throughout the whole of the long first half of the show, I feel I'm being shouted at, “full of sound and fury signifying nothing” as Macbeth might have observed. At times the amplification of the vocal ensemble is so saturated that any possibility of hearing the words is hopeless. The second half seems a little better in this respect, but whether I've now been beaten into submission or if some adjustment has been made is hard to say. When I consider the wide range of music theatre that I've seen in Christchurch over the last year or so, the blunt force nature of this show compares unfavourably with much else; most recently a production in this same theatre where unamplified singers and musicians projected easily, effectively and with plenty of decibel impact throughout the auditorium. I was once involved in a production of an earlier Schwartz musical called Working, which exhibited similar traits in its rather preaching philosophy, spectacular stage requirements and lack of any truly memorable music. Of Schwartz's other work, ‘Day by Day' from Godspell comes to mind as having an element of character and memorability, but despite this Broadway writer's huge success, especially with Wicked, he could hardly be described as a hit-maker (in a long-term sense) which, for me, is an essential ingredient for a great composer of musicals. Despite my misgivings about the work itself, Stephen Robertson's production maintains the impressive level of professionalism and detail that is his hallmark – Court Theatre's recent Chicago remains an especially memorable example. The cast for this production of Wicked is consistently strong, and although perhaps all deserve to be mentioned individually, a highlight is Chris Goodyear's (the Wizard) performance of ‘Wonderful' – rather suggestive of a different style of musical, but also somehow equally derivative in its limited originality – a welcome oasis in a desert of sameness. The curtain calls elicit a renewal of the audience's demonstrations of enthusiasm for the production and the performers, but the rather scattered standing ovation as the two witches take their bow, demonstrates, I think, that many in the audience share my reservations about the effectiveness of the piece itself. Perhaps the golden age of Broadway musicals has given way to an industrial age where the ‘production' is the star of the show with high octane spectacle and sound being the key elements.